This November, DJI was part of the 12th China High Tech Fair. 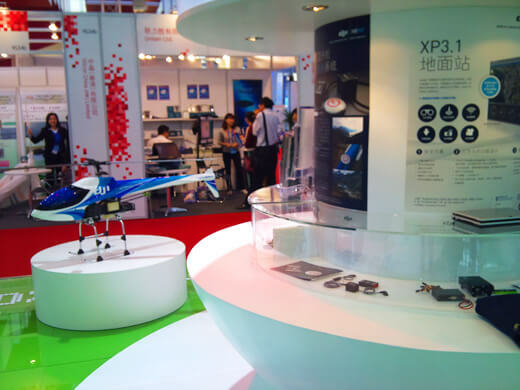 In the Hong Kong Shenzhen Innovation Circle Pavilion, we demonstrated the WayPoint, ACEONE systems, as well as DJI fully autonomous UAV Helicopter integration solution for the visitors at the fair. DJI believes that within years, China will bloom a huge market of UAV helicopters for commercial and industrial use. Compared with the market abroad, the bottleneck right now is not about whether there a suitable product of autopilot system, but the limited knowledge people obtain about what UAVs are and what they can achieve. At the fair, apart from introducing our products, we focused more on introducing the industry and the idea of future UAV potentials to the visitors, which from our past experience from expositions, was a very necessary and helpful approach. After the fair, DJI was approached by a few companies within the industry, and possibly this will lead us to establishing some business collaborations.